Choosing new countertop materials for kitchen remodeling projects is an exciting process. With so many options on the market, it’s wise to get a feel for the unique qualities of some of the more popular materials. Read the brief guide below so you can make an informed decision about your design. Plastic laminate, also known by its trade name Formica®, is a man-made material available in many colors, patterns, and textures. It’s lightweight and consists mainly of paper and resins. It can last for many years in even the busiest kitchens. If you have young children, laminate countertops are an affordable solution for the countless spills and dings it likely to occur. Granite is a natural stone that can be purchased in a wide array of shades. From variegated brown to black and vivid blues and greens, corals, and speckled creams, there are options for any decor. It comes in thick slabs that are usually seamless and treated with a sealant to make the material stain resistant. Finishes of polished or matte are available, and the surface will need to be re-sealed every so often. 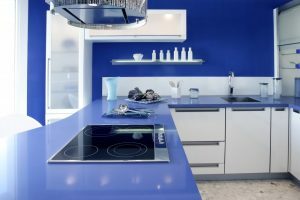 Quartz countertops are made of around 94% quartz and are mixed with resins and color pigments. They offer a beautiful finish in a large selection of colors such as rich greens, vibrant reds, cream, browns, and blacks with a bonus of shimmers and veining that resembles marble or granite. The material is scratch and stain resistant and non-porous, which means it doesn’t need to be sealed. Solid surface is a man-made material containing mineral dust, plastic resins, and pigments. It’s heat resistant, scratch resistant, and seamless. In white, it appears similar to stone, making it a cost-effective alternative for kitchen remodeling projects.